Discover the hidden secrets behind root canals: the systemic link, the potential risks and dangers never discussed in traditional dental literature, root canal alternatives, and treatment for root-canal treated teeth. Knowledge is power and Natural Dentistry will empower you with life-saving knowledge on root canal realities. The Tooth is ALIVE & Part of the System: Teeth interact with the body’s ecosystem via their blood supply and root canal channels. Patients who have seen endodontists – those dentists who specialize in root canals – understand that if the one and only tool you have is a hammer, everything is a nail – and thus with endodontists, everything is solved with a root canal. Endotontists and traditional general dentists will discuss the wonders of root canals, whilst naturopathic doctors, functional MDs, DOs, biological dentists, holistic dentists will tell you this bit of wisdom: encourage patients to RESEARCH root canal procedures, associate risk and importantly, the available alternatives. Intuition is one of our strongest, truest an most primal internal warnings – and is understandable that over 70% of patients treatment planned for a root canal prefer to avoid them. Patients are right to be wary…but maybe not for the reasons they think. The symptoms associated with root canals span across a number of publications including research papers, testimonials, peer reviewed clinical papers and books published by some of the industry’s most prolific physicians. While not every individual experiences negative side effects, others have been said to experience a combination of chronic and debilitating conditions associated with root canals. Disclaimer: The official position of the American Academy of Endodontists or AAE which is supported by the American Dental Association or ADA, is that root canals are safe and include the following statement: “Decades of research contradict the beliefs of “focal infection” proponents; there is no valid, scientific evidence linking endodontically treated teeth and systemic disease. Yet some patients still hear about this long-dispelled theory.” As such, we encourage each patient to do their own research as to whether a root canal procedure is right for them, and not solely depend on the information provided on this site. Lets first start with laying the groundwork of understanding the physiology and anatomy of a tooth and then dive into the shocking process of a root canal. The below is a typical story of a root canaled tooth and the patients Dr. Yuriy May sees daily from all over the country and internationally. The allegory below is for your education and to help you better understand the chronology of events patients experience when they don’t research root canals prior to having them done. Is a Tooth Alive or is it a Dead Bone? Does the Tooth Need a Nerve? Does the Tooth Need Blood Supply? 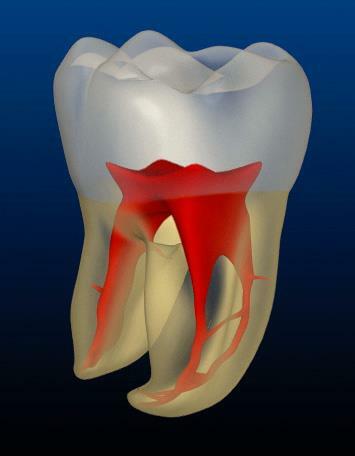 A tooth has a nerve (or pulp) inside that connects the inner structure of the tooth to the body’s waste system (lymphatic system) and nutrient system (cardivoscular system). The nerve provides the tooth with blood supply, with nutrients, and with immune system defensive cells like T-Cells and cytokines. The nerve also is connected to the nervous system and has a feedback mechanism to alarm the human body when there is bacteria or damage to the tooth, the alarm system is called: PAIN. 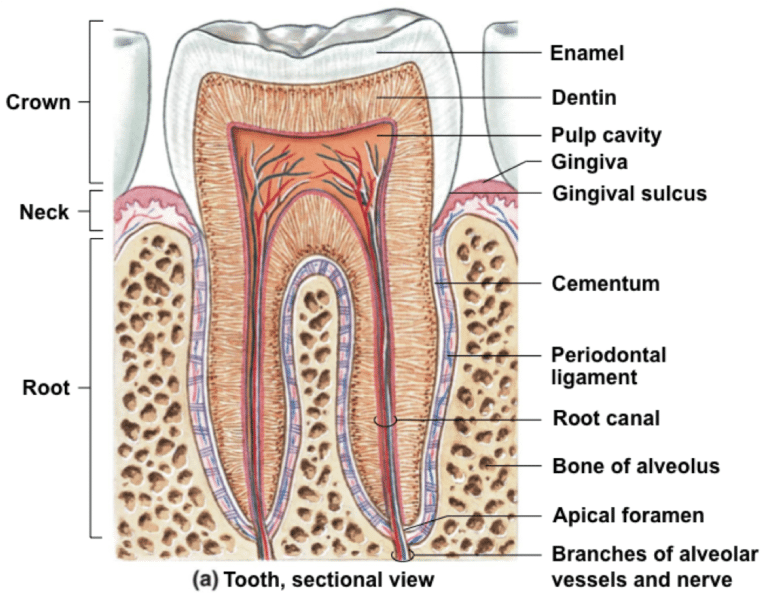 A tooth is made up of several components (See Image right: (a) Tooth, sectional view) with both the dentin and enamel being permeable, comprised of millions of microtubules which allow serum, microorganisms, nutrients and cellular debris to pass through them. Remember: a tooth is not like glass (non-permeable), quite the opposite, its like a paper towel, or better said, it is like all the other structures in our body, completely permeable. This means that microbes, pathogens, nutrients, serum and molecules all easily pass through out dental tubules and tooth structure – whether the canals are filled with gunk from an endodontist or have their original nerve and pulp inside. 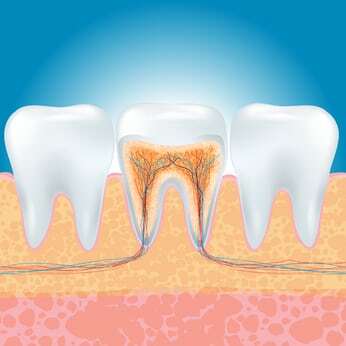 Teeth are permeable, whether root canaled or not. Event: A tooth is root canaled, usually due to infection in the pulp chamber or never of the tooth, or because the pain is differential and unattributable to any specific abnormality. The patient is relieved of pain, but not necessarily of infection. The patient goes home happy, and lives life until the potential failure of the root canal that may lead to a secondary infection…why? Lets read section 5. below. A tooth that no longer has blood supply, loses its viability, becomes a non-viable, necrotic (dead) appendage in the body, can be clinically called dead. The lack of blood supply (post root canal procedure) prevents the immune system cells from fighting infections and bacteria inside the tooth. This leaves the dead tooth vulnerable to pathogens attacking its cellular matrix and festering inside the tooth without any defense. A tooth that no longer has its nerve or pulp in the canals of its teeth, loses viability, becomes a “non-viable” tooth that is considered by biological dentists to be a necrotic (dead) appendage in the body. Removal of the nerve prevents the very precious (yet unpleasant) critical feedback system (the body’s alarm system, or pain sensors) from being able to send pain signals to the patient. While the patient and doctor may seem thrilled that the pain is no more, this is actually extremely DANGEROUS. Why? Having no pain receptor in the tooth and losing all pain signaling pathways back to the brain prevents the tooth’s alarm system from going off when a serious and dangerous infection is brewing within the root canaled, non-viable tooth. Without the “distress” signal of pain, a very serious infection could be eating the alveolus bone (the bone surrounding the bone) and the patient won’t know it until the infection is SO big that it begins to attack the adjacent teeth and tissues. Due to the lack of distress signal (pain feedback) in case of infection and decay in the tooth, most infections in root canaled teeth may go undetected for too long and have time to potentially cause excessive damage to the surrounding oral environment, including bone and tissue degeneration. In some cases, by the time Dr. May is able to diagnose and treat the silently screaming infection, often larger more invasive surgeries are required to remove the necrotic bone and tissue and significant bone grafting must be done to replace the missing bone. If adjacent teeth have not yet been implicated or lost due to lateral spread of the infection, the costs of the surgery and grafting alone, often times makes patients wish they they had done the root canal research PRIOR to trusting their traditional dentist or endodontist. Fast forward to an infected root canal: Now the biological dentist, such as Dr. May, considers extracting the infected root canal tooth (the dead tooth is going to have a funeral, as it should!) and disinfect / clean the surgical site with ozone , and then graft the extraction site with PRF grafting material to regenerate bone in order to support the ideal restoration long term: a biocompatible, metal free, zirconia dental implant! Wouldn’t it have been nice if you avoided Steps 8.1 to 8.3 and just had to incur the cost and the pain of only going through Steps 8.4 to 8.5? Our bodies are not made of solid, impermeable structures or barriers. In other words, bones and tooth structure are not 100% non-pearmeable materials through which liquid or microbes cannot pass (like steel, silicone or plastic). Our bones and tissue are all semi-permeable, which means, microbes, pathogens, nutrients, serum and molecules can pass through our tooth and bone structure at all times. This leads us to the eye opening realization that Hal Huggin’s has spent his life educating dental practitioners and patients alike on, and which holistic and biological dentists have embraced: Everything in our body that is alive is permeable, nothing in our body can be 100% sterilized, our body’s pathways are far more complex than meets the eye or the microscope, our tools to battle nature are limited, and infections are never local. 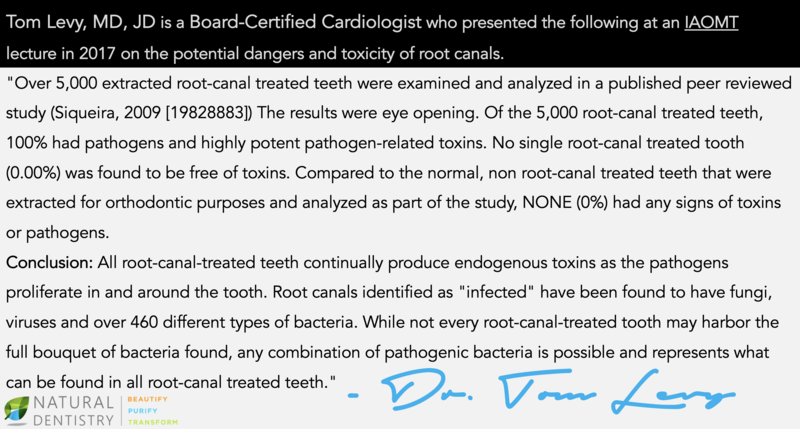 Tom Levy, MD, JD is a Board Certified Cardiologist who presented the following at an IAOMT lecture 9 in 2017 on the potential dangers and toxicity of root canals. “Over 5,000 extracted root-canal treated teeth were examined and analyzed in a published peer reviewed study (Siqueira, 2009 ) The results were eye opening. Of the 5,000 root-canal treated teeth, 100% had pathogens and highly potent pathogen-related toxins. No single root-canal treated tooth (0.00%) was found to be free of toxins. Compared to the normal, non root-canal treated teeth that were extracted for orthodontic purposes and analyzed as part of the study, NONE (0%) had any signs of toxins or pathogens. In a recent study published in April 2017, explored the associations between chronic apical periodontitis (CAP) and root canal endotoxin levels on oxidative pathways, depression and reduced quality of life. The conclusion highlighted that root canals and “leaky teeth” may be intimately linked to the etiology and course of depression, while significantly reducing the quality of life. Evidence indicated that major depression is accompanied by increased translocation of gut commensal Gram-negative bacteria (leaky gut) and consequent activation of oxidative and nitrosative (O&NS) pathways. There were significant and positive associations between Chronic Apical Periodontitis “CAP” or root canal endotoxin with the vegetative and physio-somatic symptoms of depression as well as a significant inverse (negatively correlated) association between root canal endotoxin and quality of life with strong effects on psychological, environmental, and social domains. It was concluded that increased root canal endotoxin levels (lipopolysaccharides, LPS) accompanying CAP may cause depression and a lowered quality of life, which may be partly explained by activated oxidative pathways, especially nitric oxide metabolites (NOx) thereby enhancing hypernitrosylation and thus neuroprogressive processes. Root canal endotoxin levels (lipopolysaccharides, LPS) were positively associated with CAP, clinical depression and severity of depression (as measured with the Hamilton Depression Rating Scale (HDRS) and the Beck Depression Inventory). Layman Terms: Root canals maybe intimately linked to depression, leaky gut, and lower quality of life. So what to do if a tooth is so infected that root canal therapy may be called for? There are some biological dentists who believe it can still be an option so long as the canal is thoroughly disinfected with ozone before sealing, but as we’ve noted, that may not be a good long-term solution. The position that leading biological and holistic dentists agree on, is that root canaled teeth exhibiting signs of infection should be removed and the area thoroughly cleaned with antibacterial and antifungal and antiviral agents, such as ozone, and then grafted with autogenous blood-based or bone-based bone graft material. Extraction may sound extreme, but in light of the havoc oral pathogens can cause, in our experience and opinion it really is often the lesser of two evils specially when considering the implications of root canals for long term health. Once the tooth is extracted, the surgical area will be disinfected with ozone and grafted with PRF and with an optimal clinical solution, will be replaced with a zirconia metal free (ceramic) dental implant. If a biocompatible implant is not possible or declined, other restorative options include do nothing, a maryland bridge, cantilevered or pontic bridge or a removable partial. Ultimately, the choice is the patient’s to make. The important thing is to understand the risks and benefits of any dental procedure and determine the option that best matches your needs, goals and values. What to do if an existing root canal tooth is infected? It’s easy for the uninitiated to misunderstand the science behind holistic dentistry and its whole-body health approach. Its also not the fault of dentists and endodontists that they only know what they know and nothing else – they spent 4 years in dental schools being taught that root canals SAVE teeth and that blood less, nerveless, pulpless, non-vital teeth are in fact alive, and not “dead” as biological dentists believe. Mealey BL, Rose LF. Diabetes mellitus and inflammatory periodontal diseases. Curr Opin Endocrinol Diabetes Obes. 2008 Apr;15(2):135-41. Moutsopoulos NM, Madianos PN. Low-grade inflammation in chronic infectious diseases: paradigm of periodontal infections. Ann NY Acad Sci. 2006 Nov;1088:251-64.
de Pablo P, Dietrich T, McAlindon TE. Association of periodontal disease and tooth loss with rheumatoid arthritis in the US population. J Rheumatol. 2008 Jan;35(1):70-6. Demmer RT, Desvarieux M. Periodontal infections and cardiovascular disease: the heart of the matter. J Am Dent Assoc. 2006 Oct;137(Suppl 1)4S-20S. Ruma M, Boggess K, Moss K, et al. Maternal periodontal disease, systemic inflammation, and risk for preeclampsia. Am J Obstet Gynecol. 2008 Apr;198(4):389-5. Abou-Raya S, Abou-Raya A, Naim A, Abuelkheir H. Rheumatoid arthritis, periodontal disease and coronary artery disease. Clin Rheumatol. 2008 Apr;27(4):421-7. Siqueira JF Jr, Rôças IN. Diversity of endodontic microbiota revisited. J Dent Res. 2009 Nov;88(11):969-81. doi: 10.1177/0022034509346549. Review. PubMed PMID: 19828883. Gomes C, Martinho FC Increased Root Canal Endotoxin Levels are Associated with Chronic Apical Periodontitis, Increased Oxidative and Nitrosative Stress, Major Depression, Severity of Depression, and a Lowered Quality of Life. Mol Neurobiol. 2017 Apr 28. doi: 10.1007/s12035-017-0545-z. Levy, T. Apical periodontitis, heart attacks, and chronic diseases: The hidden epidemic. Presented at: Roots of Toxicity (American Academy of Environmental Medicine, American College of Internal Medicine, International Academy of Oral Medicine and Toxicology, and International Academy of Biological Dentistry and Medicine meeting); March 2 – 4, 2017; Savannah, GA.
Legein B, Temmerman L, Blessen EA, Ludgens E. Inflammation and immune system interactions in atherosclerosis. Cell Mol Life Sci. 2013; 70(20): 3847-69. Sigueira JF Jr. Diversity of endodontic microbiota revisited. J Dent Res. 2009; 88(11): 969-81. Vidana R, Sullivan A, Billstrom H, Ahlquist M, Lund B. Enterococcus faecalis infection in root canals – host-derived or exogenous source? Lett Appl Microbiol. 2011; 52(2): 109-15. Martinho FC, et al. Comparison of endotoxin levels in previous studies on primary endodontic infections. J Endo. 2011; 37(2): 163-67. Nobrega LN, Delboni MG, Martinho FC, Zaia AA, Ferraz CC, Gomes BP. Treponema diversity in root canals with endodontic failure. Fur J Dent. 2013; 7(1):61-8. Sigueira JF Jr. Microbiology and treatment of acute apical abscesses. Clin Microbiol Rev. 2013; 26(2): 255-73. Martinho FC, Chiesa WM, Zaia AA, Ferraz CC, Almeida JF, Souza-Filho FJ, Gomes BP Comparison of endotoxin levels in previous studies on primary endodontic infections. J Endo. 2011; 37(2): 163-7. Rocas IN, Sigueira JF Jr., Debelian GJ. Analysis of symptomatic and asymptomatic primary root canal infections in adult Norwegian patients. J Endo. 2011; 37(9): 1206-12. Mahendra J, Mahendra L, Kurian VM, Jaishankar K, Mythilli R. 16S rRNA-based detection of oral pathogens in coronary atherosclerotic plaque. Indian J Dent Res. 2010; 21(2): 246-53. Ott SJ, El Mokhtari NE, Musfeldt M, et al. Detection of diverse bacterial signatures in atherosclerotic lesions of patients with coronary heart disease. Circulation. 2006; 113(7):929-37. Pessi T, Karhunen V, Karjalainen PP, et al. Bacterial signatures in thrombus aspirates of patients with myocardial infarction. Circulation. 2013; 127(11): 1219-28. Pyysalo MJ, Pyysalo LM, Pessi T, et al. Bacterial DNA findings in ruptured and unruptured intracranial aneurysms. Acta Ondontol Scand. 2016; 74(4): 315-20. Louhelainen AM, Aho J, Tuomisto S, et al. Oral bacteria DNA findings in pericardial fluid. J Oral Microbiol. 2014; 6: 10.3402/jom.v6.25835. Kostic AD, Gevers D, Pedamallu CS, et al. Genomic analysis identifies association of Fusobacterium with colorectal carcinoma. Genome Res. 2012; 22(2): 292-8.